Damascus: Rebels downed a helicopter on Wednesday as troops fought to take back a key Syrian town, a watchdog said, as international peace envoy Lakhdar Brahimi warned the conflict risks setting the region ablaze. Fighting for control of the Damascus-Aleppo highway raged around the northwestern town of Maaret Al Numan even as Brahimi appeared to have won tentative support for a ceasefire proposal. 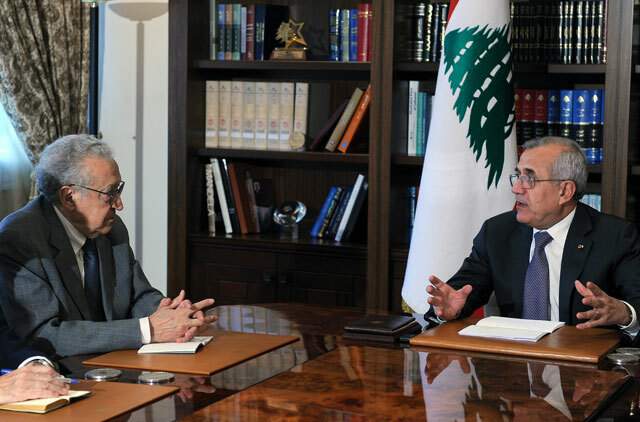 Brahimi, the UN and Arab League envoy, warned of the conflict spreading in the Middle East as he visited neighbouring Lebanon, the latest leg of a regional tour aimed at ending more than 19 months of bloodshed. “This crisis cannot remain confined within Syrian territory,” the veteran troubleshooter told reporters in Beirut. Brahimi called this week for a temporary ceasefire in Syria during the four-day Eid holiday starting on October 26. “The Syrian people, on both sides, are burying some 100 people a day,” he said on Wednesday. “Can we not ask that this toll falls for this holiday? This will not be a happy holiday for the Syrians, but we should at least strive to make it less sad. “If the Syrian government accepts, and I understand there is hope, and if the opposition accepts,” a truce would be a step “towards a more global ceasefire,” said Brahimi. The Syrian conflict began in March 2011 with pro-reform protests inspired by the Arab Spring uprisings. On the battlefront, rebels shot down a helicopter gunship in the country’s northwest as the army fought to recapture the strategic town of Maaret Al Numan, said the Syrian Observatory for Human Rights. “In Maarhtat, on the outskirts of Maaret Al Numan, rebel fighters downed a helicopter being used in the fighting,” the group said, adding it crashed in nearby Bsida according to initial reports. Regime warplanes targeted a rebel blockade of a highway in Idlib province which has halted the regime’s efforts to get reinforcements to Aleppo, theatre of intense fighting for the past three months, said the Observatory. The early morning air raids targeted Maaret Al Numan and nearby villages, which fell to the rebels a week ago as they pushed their quest to create a northern “buffer zone” abutting Turkey, it said. The clashes erupted as rebels attacked a six-tank convoy of government troops in the town of Maarhtat as it was making its way to reinforce the nearby Wadi Deif army base, the largest in the region. At least five people were killed across Aleppo province, including in the city of the same name, as government forces pounded the area and clashed with rebels who fired rockets into an army base, said the Observatory. The Observatory — which relies on a network of activists, medics and lawyers for its information — says some 33,000 people have been killed since the revolt began in March last year, among them 2,300 children.